1. Are you a psychic? No, I’m not a psychic although some would argue the point with me. The nature of all my tarot readings comes from experience with the cards and a long standing trust of my intuition to interpret the messages given by the cards with an intuitive analysis. 2. Do you actually write the reading, or is it computer generated? The interpretation of the cards is written by me and is a unique and personal Tarot Story for you. Each reading includes approximately 300 - 600 words per card and is hand crafted into page layout software and exported to a .pdf file for you to download and/or print. Each card in the Tarot Reading Story is associated with a set of predetermined meanings and symbols. I keep archives of those meanings stored on my computer in a database. This means you may receive similar text for a card if it turns up in a second reading. The unique variables in your Tarot Story such as card parings, card positions within the layout, timelines, and relevence to your question are all written as the reading takes place. Currently, all readings are done in a first come, first served order. The average window of time to receive your reading is within 48 hours of receiving your question. I will notify you if my reading schedule is likely to push outside of that time frame. 4. Why can't I pick my layout? In most circumstances the layout or spread of cards is based on the number of cards purchased and the nature of your Inquiry. Once I read your question and have the cards in hand - I begin to listen to the cards. The layout is chosen while mixing the cards. Concentrating on the layout strengthens my connection process between your question and the cards. If you order a comprehensive reading such as The Executive Oracle, or the Reading of the Rose - those spreads are very specific and serve as a predetermined roadmap for the cards. 5. Can I schedule a live reading over the phone or internet video call? 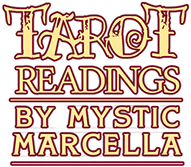 Currently, I am not available for live readings, but please visit my YouTube channel and watch some of the Mystic Marcella videos. Its a good way for us to connect without physically being together. In early childhood, my mother diagnosed me as a “Wednesday’s child is full of woe.” I was born on a Wednesday, and evidently that was my mom's way of explaining my bouts of moodiness and streams of unusual questions. Sometime later, my mother was reassured by a psychic peer that I was exhibiting the typical characteristics of a sensitive, more commonly known today as an intuitive or empath. Mom taught me to read the Tarot cards when I was 11 years old. (Thus making me a third generation reader on the maternal side.) The different pictures and symbols decorating the Tarot cards held my attention and curiosity. The card meanings, positions, and side-by-side interactions connected into a full and robust picture about 10 years later as adulthood provided me with more real-world experience. Starting with my first desktop computer in the mid 1980's, I have built a personal digital archive of card images, readings, intricate Tarot combinations, and I designed a loose (unpublished) deck of my own. The current technology boost and the outreach of the internet allows me to bring my love of Tarot and extend my outreach by offering 'wireless' email Tarot Reading Stories worldwide. I interpret your Tarot cards using intuition and traditional meanings and then weave them into a Tarot Reading Story. My goal is NOT to tell your future but rather to provide a Tarot Story that may serve to guide and reveal inspiration for opportunity, growth and happiness along an immediate course or journey. The Tarot Reading Story may help you recognize the best choices for personal progress and help you avoid or push through obstacles that may be preventing your success and happiness. My readings are rarely negative as I believe that each challenge is there for a reason and I want to help you attain a sense of clarity and purpose. I hope you will enjoy this site and your own personal journey with the Tarot Reading Story.